The head of BBC England has outlined plans to expand further in the North in an interview contrasting starkly with his comments on the West Midlands. 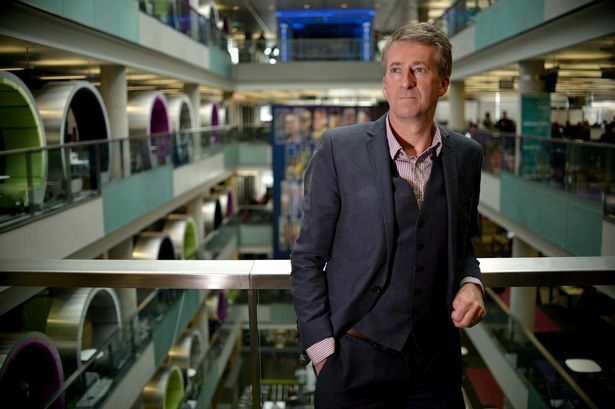 Speaking to the Manchester Evening News, Peter Salmon said the "revolution" which had seen BBC Sport, Children&apos;s and Radio 5 Live shifted to Greater Manchester was "just the beginning". He hinted at plans for more commissioning power for BBC North and boasted of his vision for a "thriving creative community", with the BBC, ITV and others working together. Meanwhile, MPs in the Midlands have been calling for commissioning in the region which produces none of the BBC&apos;s prime-time television. Mr Salmon said: "We used the moment to transform ourselves; with new studios, technology and talent. It&apos;s been a huge boost to the North West economy. "I still get a kick out of being in Greater Manchester. The staff loved the move; they love the North. It&apos;s affordable, people are friendly and the weather, contrary to expectation, isn&apos;t bad." Major investment from the BBC has transformed the area around Salford Quays on the back of television and radio production. Presently, more than 24 departments are operating in Salford, with Mr Salmon promising more. As a result, the 441 hours a year of television created in the North is now closer to 1,800 hours. By comparison, the BBC is promising more than 130 hours of television drama from the Midlands next year - of which none will be prime time. His interview contrasted with his letter to the Post earlier this year, in which he accepted BBC Birmingham "has not received the attention that it should" but did not respond to calls to abate a crippling lack of production in the region. It stated: "Our strategy isn&apos;t and can&apos;t be about recreating a huge BBC-owned facility like Pebble Mill. "Apart from the fact that modern media production has changed, and TV production in BBC-owned studios is not the way the sector works any more, we are committed to our Mailbox base and building on the foundations we now have in Birmingham." Last year, only 8.5 per cent of the £942 million Midlanders invested in the BBC - a total of £80 million - was spent in this region. The Post is campaigning for the broadcaster to reinvest half - as it does in all other UK regions - and it recently announced a spending rise that will take that figure to 13 per cent. By comparison, the broadcaster invested £480 million in the North, which represented 55 per cent of that spent in licence fees by Northern families. However, Mr Salmon intimated rising investment would continue. Birmingham MPs Gisela Stuart and Richard Burden have been pushing for a West Midland commissioner to boost drama output reflecting this region. While no prime-time television is made in the West Midlands, there has been a run of successful productions in the North West following major investment. Among them are Peter Kay&apos;s Car Share, which was written by Solihull&apos;s Tim Reid but based and filmed in the North, The Syndicate and Happy Valley, starring Mr Salmon&apos;s wife Sarah Lancashire. Mr Salmon said: "I wouldn&apos;t want the rest of the BBC to think we&apos;ve got too northern. "But it would be a lovely problem to have. I&apos;m genuinely chuffed our drama and comedy output is as strong as it is. They&apos;re two of the genres we know northern audiences love. "We&apos;ve tried to get that northern talent - the likes of Peter Kay and writer Sally Wainwright - to focus on the BBC because we&apos;re here in larger numbers and keener than ever to please our audience. "If we could have put a bit more commissioning power at the heart of BBC North, I think I would have been a bit more comfortable. "As it is, we just have to thrive off our nervous northern energy. You&apos;re always thinking to yourself: &apos;Any day now, someone&apos;s going to shut us down, so we better fight extra hard for the right to survive and thrive&apos;." He added: "We&apos;ve got to fight for a good licence fee settlement so we can keep investing in the north of England; so we have the means to match our ambition." Writing to the Post earlier this year, the BBC England director, who also heads up BBC North, suggested the focus would be on daytime production here. He said: "Whilst some critics might sniff at the daytime drama Birmingham is already famous for, we want to build on our reputation as a centre of excellence in that genre. "I know (BBC Birmingham director) Joe Godwin is already working with commissioners and controllers to celebrate our network TV and radio story more, which in turn can increase opportunities for in house and indie commissions from Birmingham."